Stay "in-the-know" about what's happening in and around our district. From award winners to recent events, you'll find it all right here on our News page. Check back often to see what we're up to! 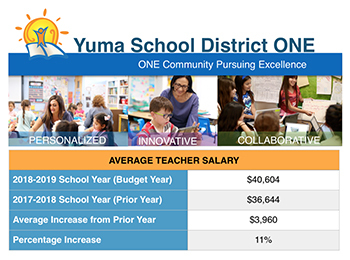 Yuma School District One has increased the average teacher salary by 11%. This spring, the Special Olympics of Arizona hosted an event for all schools in Yuma County, and many of our district schools were in attendance. We are proud of our schools for partnering general education students with special education students to promote inclusion and unity. This inclusion was highlighted at the two-day olympics, but is practiced every day at District One schools! School safety is our district’s priority! All 17 of our schools met to work through a table top activity related to emergency preparedness. School teams included principals, assistant principals, counselors, health services personnel, and school resource officers. This is just one of many activities that we engage in to ensure we are always prepared for any situation that may occur! 4th Ave Jr. High hosted a college and career day for their 8th grade students. Several colleges and businesses attended to share information to help inspire students to think about their future. What a fun and rewarding experience! Stay informed and connected by clicking sign-up to receive a monthly issue of our District One Community E-Newsletter. We love to keep our community up-to-date. Sign up to receive email news and information from the Arizona Department of Education.